After Paris-Brest-Paris, we surveyed the American riders to find out what equipment worked best for this strenuous 1200 km ride. The results were interesting. For example, riders using a Camelbak or backpack had a 50% higher chance of not finishing than those who did not wear a pack. Riders with fenders suffered less than half as many DNFs due to problems with their lower extremities on this rainy ride. We look at our editor’s classic Alex Singer that completed the ride in just under 50 hours, and we test two modern 650B randonneur bikes. We examine crank tread (Q factor) and list measurements for dozens of cranks. We also discuss how to teach children to ride a bike. 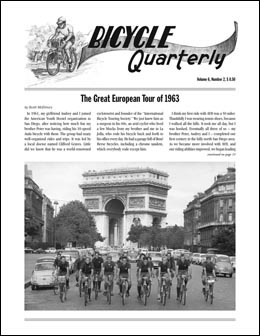 Scott McElmury takes us on a tour of Europe in 1963, the first of Dr. Clifford Graves’ famous European tours. To prevent bike problems from spoiling the group’s experience, every participant received a brand-new René Herse bicycle at the start of the journey. That way, all were on identical bikes, and apart from flat tires, the group experienced no bike problems at all. It was a splendid adventure, and ride leader Scott McElmury tells us all about it.